GEELONG has continued to take the approach of farming from its own backyard, selecting three players from its VFL side in Friday night's NAB AFL Draft. After taking Tom Ruggles with pick No.44 in last year's rookie draft, the Cats have again gone local by selecting Tom Stewart (pick No.40), Timm House (No.68) and Ryan Abbott (No.69). The Cats also took Brandan Parfitt (No.24), Esava Ratugolea (No.42) and Quinton Narkle (No.60) with their three other picks. Geelong list manager Stephen Wells said it was handy to have seen the three local products develop up close, but it was not a specific ploy in their draft method. "We cover the country and we consider them all. It's nothing more than coincidence that three players have come out of our VFL team," he told AFL.com.au. "We would have been happy to pick any player from across Australia if they fit our needs but we're also very happy when they play with our Geelong VFL team." 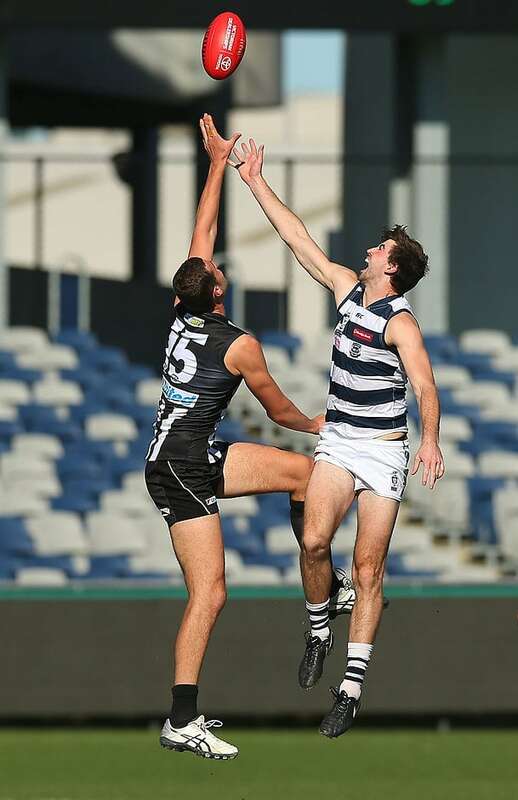 Stewart, who was mentored by Matthew Scarlett at South Barwon, played 18 of a possible 19 games for Geelong's VFL side and was the first mature-aged player selected in this year's draft. The 23-year-old was named in the VFL Team of the Year after an outstanding season, although his progress will be halted until Christmas after he had reconstructive shoulder surgery at the end of the season. House, originally from Claremont, kicked five goals in his first VFL game and is an athletic key forward with plenty of potential. At 194cm, he covers the ground well and has the ability to clunk pack marks. Abbott played 16 games for Grovedale in the Geelong Football League, but did enough to prove to the Cats' recruiting staff that he deserved an opportunity at the top level. The big man stands at 200cm and is prepared to get his hands dirty by fighting for loose balls and guiding the ball to his midfielders in ruck contests. Stephen Wells says: "We rated Brandan really highly. He was an All Australian in his Under-17 year. He's a terrific, developing midfielder. He can play in the forward line as well and we're very confident that once he gets to Geelong his development will continue." Stephen Wells says: "Tom had a terrific year with our VFL team and has earnt his chance. We were very happy to call out his name. He's got a terrific, aggressive attitude to defending and he can also join in the attack that is generated." Stephen Wells says: "Esava is a player who had a really good second half of the year. We think he's a project who will develop and will improve and we're confident that once he gets into the AFL system he'll really come on well for us. He can pinch-hit in the ruck but he'll certainly get the opportunity to develop as a forward." Stephen Wells says: "Quinton is an elusive player around stoppages with good speed to burst away from congestion. He's clean with the footy and has the ability to push forward and hit the scoreboard. Stephen Wells says: "Timm's an outstanding mark and hopefully that can transition into the AFL competition. He's physically a bit more mature and ready to go than some of the other key position types that we were considering." Stephen Wells says: "He's an experienced ruckman with the physical capability of playing right from day one. He's got some development in him, so hopefully he can continue to get stronger and improve with the full-time commitment he's now got at Geelong."